ADF application with UI Shell and ADF Task Flows rendered in dynamic tabs would not offer instant switch from one tab to another experience. Thats because tab switch request goes to the server and only when browser gets response - tab switch happens. There is more to this - even if tab in ADF is not currently active (tab is disclosed), tab content (e.g. region rendered from ADF Task Flow) still may participate in the request processing. If user opens many tabs, this could result in slightly slower request processing time overall. ADF allows to render ADF Task Flows directly by accessing them through URL, if it is configured with page support on the root level. 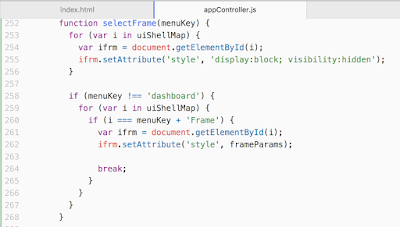 ADF Task Flow can be accessed by URL, this means we can include it into iframe. 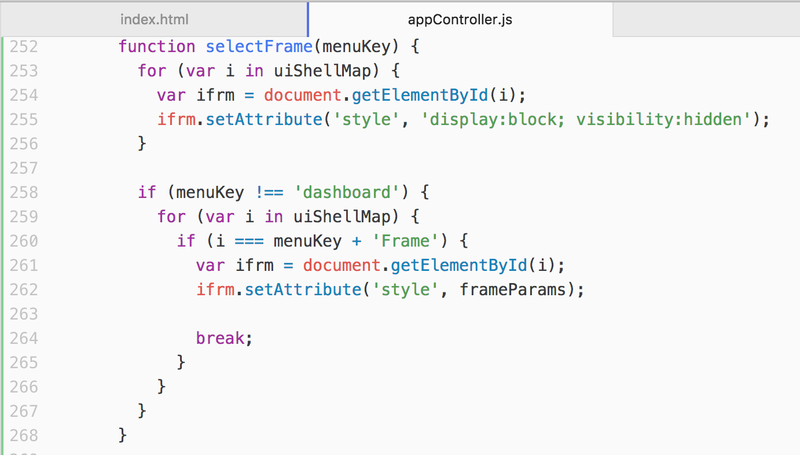 Imagine using iframe for each tab and rendering ADF Task Flows inside. This will enable ADF Task Flow independent processing in each tab, similar to opening them in separate browser tab. Main functions are listed below. Download sample app from GitHub repository. @"There is more to this - even if tab in ADF is not currently active (tab is disclosed), tab content (e.g. region rendered from ADF Task Flow) still may participate in the request processing." - I noticed exactly the same! Why is so, and have you idea on how to avoid this strange behavior? This is how ADF server side works, it needs to process all open resources during request, even some of the resources are not really used. This was one of the main reasons, why I created JET UI Shell wrapper - to avoid this behaviour. This is a really bad. One question: do you have some experience with complex ADF UI Shell applications in production? For example, with max 6 opened tabs, each having Isolated taskFlow inside. I know it depends of application, but many simultaneous users such one application can support? Also I am interested in AM pooling params. We have just one app module. In order to support 100 sim. users, what should be value of Referenced pool size? 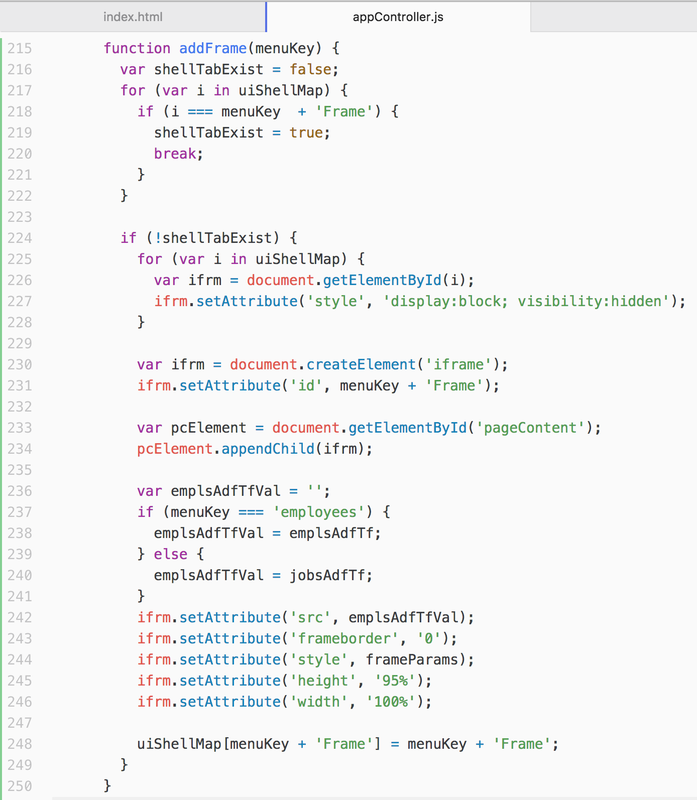 Well, this is how framework works behind the scenes. Whatever resource user keeps active at the moment, as AM's - these resources are revisited during request. This means AMs from open tabs (the ones which are open, but not disclosed too) - will be 'touched' and DB connection will be established and released instantly. Based on our tests, if user opens 10 tabs with ADF TF's, delay for request processing could be around 1 second. But if same app is deployed on powerful server, delay for this functionality drops to 0.25 second. So, it really depends on server side processing power. Regarding your question: yes we have both Oracle UI Shell and custom ADF UI Shell apps in production. Typically we allow to open up to 10 tabs with ADF Isolated TFs. If application is well tuned, and server hardware is strong - typically it can run 500 concurrent users per each managed server node. This means if you need to support 2000 concurrent users, would need to have 4 nodes. Yet, when running app in integrated WebLogic, (module that just display data from one DB table in read-only mode) we noticed that framework calls ApplicationModuleImpl.passivateState(), very often. Is not that pretty unusual? @" If application is well tuned, and server hardware is strong - typically it can run 500 concurrent users per each managed server node." -Can you specify more precise what "strong hardware" in your case means? I would set Minimum Pool Size to 0 and increase Idle Instance Timeout to be more than web session timeout. But, if you still have passivation/activation, means app code is written badly and only tuning would not help. Normally if Referenced Pool Size is set to be more than number of sessions, there should be no passivation/activation. And I just call Thread.dumpStack() in the overriden passivateState(), in order to see what actually causes AM passivation. Can you comment something on this? This approach improves performance and user experience, but i have a couple of questions as i have no time to test them. How to handle dirty states, as you can not handle that from JET (in order to warn the user). 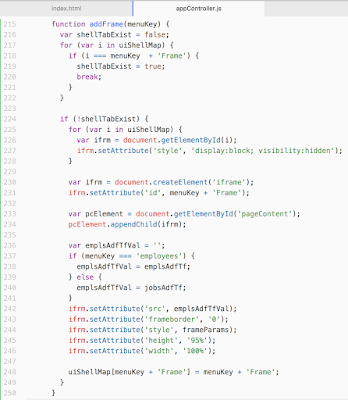 Perhaps you have to deal with iframes unloading, in order to use a beforeunload event of ADF side (or perhaps your code can already fires that event). I don't know if beforeunload event of ADF side will be executed, and the event of the JET iframe component can not detect any ADF dirty state. If TFs are URL invoked and you can close the tabs from JET, then the TFs are not finalized when using application, so this approach increases the number of "zombie pageFlow scopes" that will die when session expires. Enough memory would avoid any problem, but i wonder if this cloud be handled some way. Anonymous, something is messed up in your code. If you get passivation/activation while running on integrated server with single session, something is really really bad in the app. This would required code debugging, to answer what is wrong exactly. But I'm sure - tuning alone would not help, until code is not fixed. I'm willing to help you, if you want please get in touch by email and we could have a call on Skype to debug it. Juan, thanks for your questions. Thanks for the help offer, but everything is fine with our app. Simply, there is multiple passivateState() methods in the ApplicationModuleImpl. which framework calls only if AM passivation really happens. Ok, so there is no passivation/activation really. Let me know if further help will be required. We could share our ADF runtime performance audit tool, which logs system runtime metrics specific to ADF and this helps to tune problematic system areas. And that machine serves both database/WebLogic, or WebLogic only? Is there any website related to your audit tool? This machine is dedicated for WebLogic only. Keep in mind - we dont sell this tool, but give away for free (including source code). But we don't allow public download. To get it, you should send email to me, describe in more detail your ADF implementation and we give URL to download. I am sent you mail. Just to verify - 392 GB RAM for one WL instance? What is JVM memory arguments? Thats for WLS cluster of course. Normally we set up to 6 GB heap size per managed server. I dont have list of JVM params, not administering the environment.